Entrepreneurship Program director Ryan Holbrook (left) poses with Steven Van Alen and Martyna Skrodzka, the Sleepyhead team, after announcing them as winners of the 2017 Bull Ring Competition. Photo by David J. Hawkins. CSUN psychology student and MyGymPals CEO Muris Mulalic (left) pitches his app to the judges. Photo by David J. Hawkins. Josh Halem, a CSUN business management student, displays Germ 3 Solutions' body substance isolation sleeve. The sleeve is designed to prevent the spread of germs during blood pressure tests. Photo by David J. Hawkins. The Bull Ring finals judges. (L-R) PCS Development CEO Paul Jennings, Enplug CEO Nanxi Liu, R6S CEO Ash Sobhe and COACCEL co-founder Cam Kashani. Photo by David J. Hawkins. Jeff Marine, a CSUN alumnus and CEO of JEM Sportswear, funded the Bull Ring's prize pool and served as keynote speaker for the final event. Photo by David J. Hawkins. Sleepyhead, an e-commerce sleep startup that sells boxed memory-foam mattresses and bed toppers, won the $20,000 first-place award at the final round of California State University, Northridge’s second-annual Bull Ring New Venture Competition on May 2. Steven Van Alen, a CSUN business management student and Sleepyhead’s CEO, said the win was a surprise. MyGymPals, a mobile app that connects gym-goers to foster fitness communities, finished second, and Germ 3 Solutions, a company that sells products aimed at preventing the spread of germs in hospitals, came in third. The teams won $10,000 and $5,000, respectively. The runner-ups were Tint, an app that helps users shop for clothes by color, and Omnigreen, a company that builds plant-based air purifiers. Ryan Holbrook, director of the David Nazarian College of Business and Economics’ Entrepreneurship Program, noted that Mulalic and many other competitors were not business majors. The competition was co-hosted by the Nazarian College and LACI@CSUN, CSUN’s on-campus branch of the Los Angeles Cleantech Incubator. 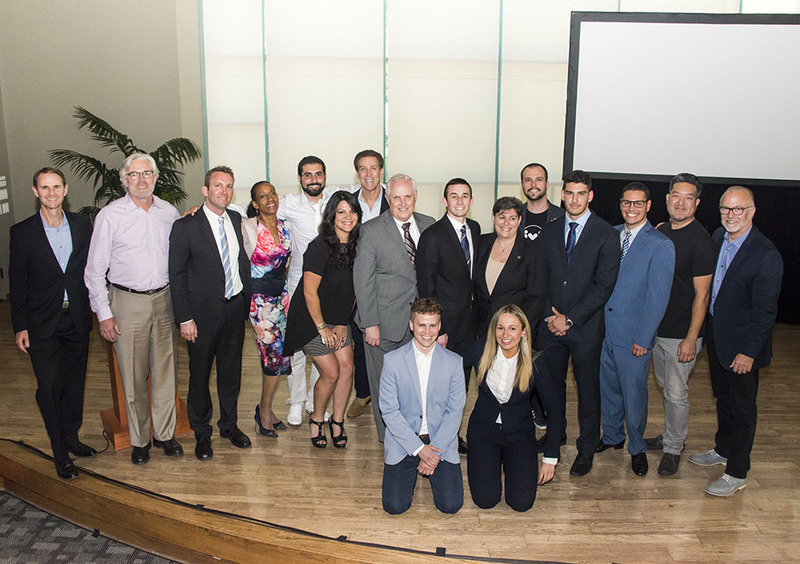 The cash prizes were funded by CSUN alumnus Jeff Marine, founder and CEO of JEM Sportswear and Awake Inc. Marine also served as the final event’s keynote speaker. The top three finishers also will receive legal startup services courtesy of DLA Piper; accounting services courtesy of Armanino, LLP; marketing services donated by SKY Marketing Consultants, a psychological brand-design studio; and a three-month trial membership to LACI@CSUN. The winners were decided by four judges who assumed the roles of potential investors. The panel consisted of Enplug CEO Nanxi Liu, COACCEL co-founder Cam Kashani, PCS Development CEO Paul Jennings and R6S CEO Ash Sobhe. Sobhe, a CSUN alumnus, said it is “absolutely incredible” to see students embrace entrepreneurship as the Nazarian College continues to nurture their ambitions. As the contest concluded and teams posed for pictures with the organizers and judges, some participants said they could not help but enjoy the moment. MyGymPals’ chief marketing officer Wan Song cracked a wide grin while waiting for a photo when Pharrell Williams’ hit song “Happy” began to echo through the University Student Union’s Grand Salon. “This is the perfect song right now,” he said. For more information about the Bull Ring New Venture Competition, visit http://www.csunbullring.com/ or contact Ryan Holbrook at ryan.holbrook@csun.edu or (818) 677-4510.